You don’t need to use cream to get a creamy pasta sauce, use butternut squash instead. With this Creamy Butternut Squash Pasta Sauce, you get that creamy comforting flavour, but with added vitamins too and not a cauliflower in sight. There are a lot of healthier creamy pasta sauces out there, but a lot of them use cauliflower (not that I am complaining), so I thought I would give an alternative for those of you out there that aren’t loving cauliflower. Butternut squash has a naturally creamy texture when blended, so we have put that to good use. If you don’t usually like butternut squash, give this a try as it might just change your mind. What’s also great about this sauce is that it freezes really well too, so make an extra batch and portion it out and put it in your freezer for a really quick and convenient dinner. Speaking of convenience, we try to cook everything from scratch as much as possible, but we aren’t perfect due to busy lives, so we do buy some convenient ready made food like ravioli. However, when we do we go for the best quality possible so we know it is full of the best ingredients and it’s going to taste great, which is why we choose Giovanni Rana. Loved by Italians everywhere, Giovanni Rana, is Italy’s favourite fresh pasta and it’s easy to see why when you can get it filled with delicious sundried tomatoes, olives and mozzarella, which is what I used in this dish. Their fresh filled pastas are made with the very best ingredients in Verona (where they have been made for over 50 years), in order to create a unique product of the highest quality that is authentically Italian. As I have spoken about many times before, for me Italian food is all about simplicity and not overcomplicating recipes with too many ingredients, which is why I have kept this sauce really simple and why it goes so well with the ravioli. Keep your meals simple and you can #liveitalian! I also think that people have a tendency to over cook pasta, and you don’t want to make the mistake with this filled pasta. You just need to cook it for 4 minutes (how quick and easy is that!) and then take it out of the pan with a slotted spoon, because it’s really delicate. You also don’t need to drown pasta in sauce, just add a little bit as less is more when it comes to Italian cooking. I really am on an Italian kick at the moment, maybe it is a sign that I am desperate to go back to Italy, so expect to see lots more delicious Italian recipes on the blog soon. I know you lot are not going to complain about that! With this Creamy Butternut Squash Pasta Sauce, you get that creamy comforting flavour, but with added vitamins too and not a cauliflower in sight! Heat a little oil in a large pan and add the butternut squash, garlic and onion. Gently cook for 5 minutes until softened. Add the stock and black pepper and simmer for 15 minutes. Add the basil about 4 minutes from the end. Transfer to a blender and blend until smooth and serve with Giovanni Rana pasta. Made this tonight as I was looking for a tomato free sauce for pasta…DELICIOUS! Only tweak I made was using fresh sage instead of basil (I didn’t have the latter), worked really well as BNS & sage are a great pairing. I absolutely love using veggies in sauces or to ‘replace’ something. 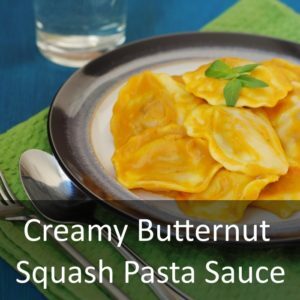 Using butternut squash in place of cream sounds amazing, a must try for sure. LOVE this! Huge butternut squash fan and I love the idea of it being used a sauce. I used to use pumpkin a lot and mix it with cream cheese as a sauce but this sounds a bit easier as pumpkin is always tricky to find. Such a lovely idea very innovative use of the squash nad its low fat too compatring to cheesy sauces. This looks like just my sort of dish! I love creamy sauces, and love Giovanni Rana pastas. This looks heavenly! I can’t wait to try this recipe out at home, it looks so yummy! This looks so tasty, love discovering new combinations. I love pasta but never tried making it with a creamy butternut squash sauce, it sounds like a wonderful idea though. Pinning to try later!